James J. McNamara, 96, passed away on Friday, August 3, 2018 at the Paramus Veterans Memorial Home, Paramus, NJ. Relatives and friends are invited to meet at Brigadier General William C. Doyle Memorial Cemetery, 350 Province Line Road Wrightstown, NJ 08652 on Tuesday, August 14, 2018 at 10:40AM. An Inurnment Service will begin at 11:00 a.m.
Born in Kearny, James lived there for many years before moving to Nutley 16 years ago. He has lived in Paramus for the last six months. He served in the U.S Army during World War II as a Medic and drove an ambulance. Mr. McNamara was a Sheet Metal Mechanic for Otis Elevator Company in Harrison, NJ for 32 years. After, he worked in the same capacity for ITT Corporation in Nutley for 10 years. 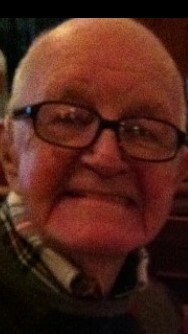 James tended bar for 25 years at Ship Ahoy in Harrison then at Montclair Golf Club in West Orange, NJ. He was an honorary member of the Lions Club in Harrison and was a member of the Delaware Water Gap Country Club. Mr. McNamara is survived by his daughter, Elizabeth M. Banach and her husband, Thomas; siblings, John McNamara and Jean Flanagan and three grandchildren, Curran, Luke and Catherine Banach. He was predeceased by his wife Veronica (nee Campbell) McNamara and two brothers, George and David McNamara.